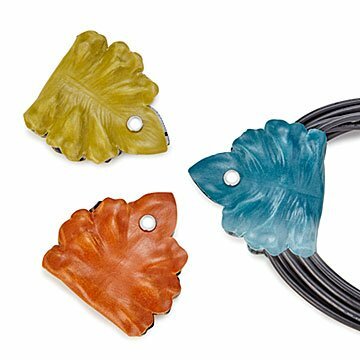 These palm-sized, leaf-inspired wraps snap around coiled cord to keep it tidy. Using vintage millinery dies, Crystalyn Brennan molds vegan leather into palm-sized, leaf-inspired wraps that snap around coiled phone and headphone cords to keep it tidy. With cheerful colors, contrasting linings, and faux pearl snaps, they keep your electronics organization stylish, too. They make handy gifts for travelers, teachers, and decluttering coaches. Handmade in Brooklyn. Crystalyn Brennan's first encounter with the magic of unconventional style began with childhood Saturdays with her grandfather, Jack. Dressed to the nines with his own odd flair for fashion, he mixed red plaid with yellow argyle, white perforated leather shoes, and a matching belt. Jack’s quirky way of mixing prints resonated with five-year-old Crystalyn. Decades later, she used those same plaid pants combined with vintage floral fabric for her first collection of handbags, which she took door to door to boutiques in San Francisco and New York. Today, Crystalyn designs and produces her collection in her Brooklyn studio, incorporating quality vintage fabrics and rich color palettes, with an emphasis on style and function. She's passionate about saturated color and texture, and committed to creating truly original, handcrafted accessories using earth and animal-friendly materials. Clever, stylish, and useful - a great gift for anyone! Great for storing laptop cords, or an attractive way to organize bunches of cords at a desk, strings of lights, vacuum cord - the list is endless. Such a cute design and so handy for so many things. A great find!